Moms: The onslaught of blogs and social media outlets say "good" moms breast feed, make their own organic foods and never buy microwavable anything...especially dinosaur-shaped chicken nuggets. They are crafty, don't work outside the home and spend their days sewing quilts and embroidering keepsakes, baking pies and cooking gourmet dinners while never getting frustrated with their kids. They establish traditions in their home that their perfect children will pass on to their own perfect children one day. The house is never messy and the hair is always fixed. The kid's birthday parties are perfectly themed down to the coordinating napkins, streamers and goodie bags. The Christmas card photo is not only flawless but is actually mailed to family and friends by Thanksgiving - a feat in itself. They spend an hour in quiet and prayerful solitude every morning with Jesus, then do their lunges, squats and sit-ups...all before the kids wake up at the crack of dawn. And they homeschool, of course. And if they're tired, they're weak. If they're anxious, they're unspiritual. If they fail, they're unworthy. Please, do yourself and your kids a favor - guard your heart against the expectation of these things. These are all good things, but refuse to be defined by them. Don't measure your mothering by their standard, and deny the temptation to compare yourself to those who do them all better than you. Be faithful to Jesus, the source and security of your identity, and be far removed from any perceived pressure to measure your mothering by any other standard than what Jesus has already set - faithfulness to Him. The best thing you can do for your kids is love Jesus well and trust your value, identity, purpose and capacity to be a mom into His hands. The crafts will eventually be trashed, the food long forgotten and your perfect abs vastly unappreciated by your kids - but the legacy of loving and being loved by Jesus and leading them from that posture will last. This is not a call to boycott Pinterest, Facebook, Twitter and the blogosphere. These mediums are not the problem. At the end of the day it's an issue of the heart, not the computer. It has less to do with what you're pinning and more to do with what you're believing. For as instructive as home decor and parenting sites may be about what you can do, Jesus has been abundantly clear about who you are - a fully accepted, perfectly redeemed, unbelievably loved and eternally cherished daughter of God. The work you do in your home is sustained only by the work He has done and continues to do in your heart. In the often mundane moments of mothering you must cling to the magnificent promises of God - promises that are as true in those serene nap time hours as they are in those whirlwind "witching hours" of dinner, bath and a valiant attempt at a family devotion before bed (that is only as spiritual as the 17 second attention span your young kids allow!). The good news is that Jesus does not call you to control everything, nor does He expect you to. Actually, He wants you to be okay with the fact that you can't. Your "success" as a mom is not measured by your capacity to keep everything in order; it's determined by your ability to trust that even in the chaos Jesus is beautiful - and even in the mess, so are you. Resolve to reject the photoshopped version of motherhood this world projects on you and choose daily to believe something greater for you and your kids. In the end your kids care far less about how presentable their dinner is and far more about how healthy their mom is. They may not understand it in these terms, but they certainly reap the implications of it. Your kids need you to be a daughter of God before you are a mom to them. 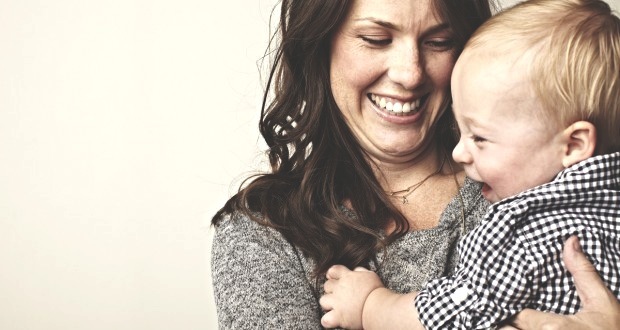 While a "good" mom may do a lot for her kids, a "great" mom understands all that Jesus has done for her. Her mothering flows from there, even if the dishwasher doesn't get emptied that day.